I’m a Brooklyn boy, technically. My parents were living in Queens, but my Mom gave birth to me at Brooklyn Women’s Hospital. I love coming home to NYC when possible, and I’m especially thrilled that my daughter is as excited about the city as I am. Getting off the Triboro (now RFK Bridge), we moved onto the FDR Drive, heading south toward midtown. She cracked the window open, sniffed the air and said enthusiastically: “Mmm.. Can you smell the hot dogs and pretzels?” Yep…that’s my kid. My wife has a couple of business conferences in Manhattan every year, so my daughter and I take advantage of the free hotel room, and visit any combination of museums and stores. 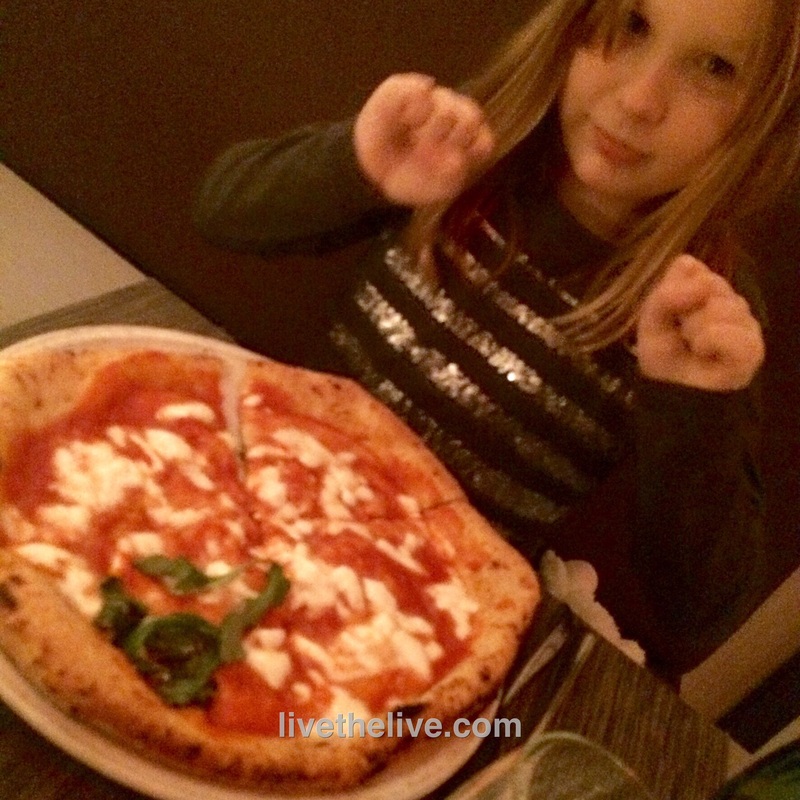 Our trip started with dinner at our favorite Italian restaurant in the city: Pizzarte on W 55th Street. It’s our favorite because of the magnificent creation called Pizza Montanara. They stretch out the pizza dough, then fry it quickly so that it puffs up as light as a cloud. They sauce and cheese it and slide it in the brick oven. Moments later: absolute pizza perfection! No better pie in the city. Their other menu items, like the beef carpaccio and Frittura di Mare (fried shrimp and calamari,) are fantastic. 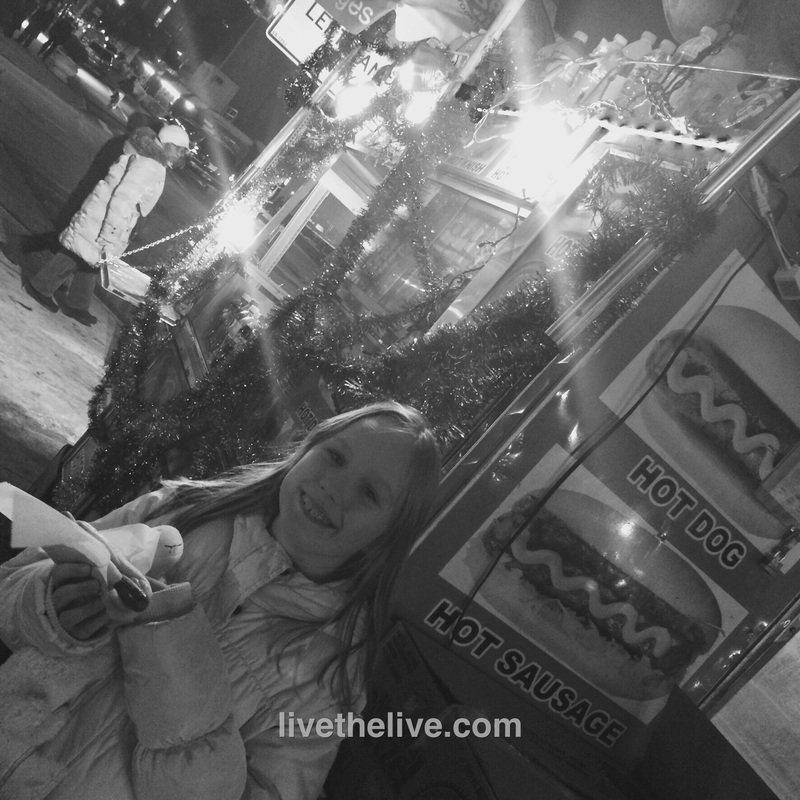 Even after all that food, a hot dog is a must! A late arrival meant a late dinner, so we walked back to our hotel, The London, and finished the evening with a couple of cocktails: a Hendrick’s and tonic for me…a Shirley Temple for my daughter. You won’t find any fancy mixology at this bar, but it’s a great spot for a basic cocktail. 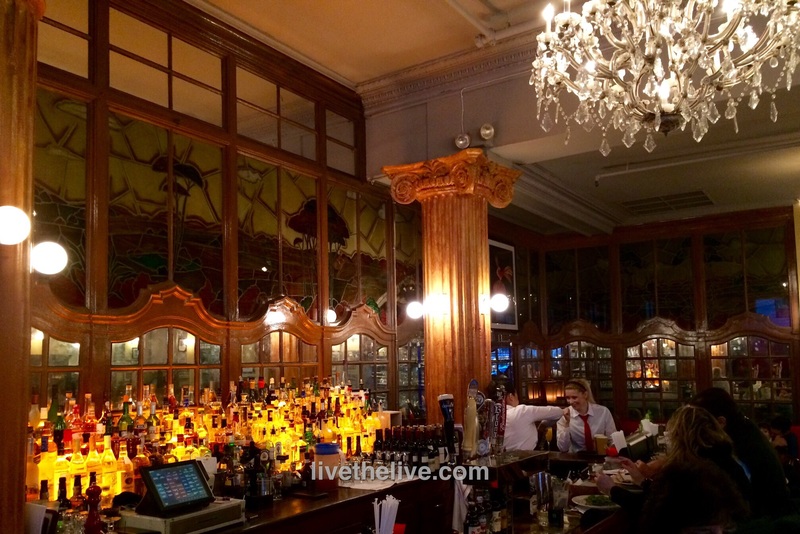 The bar at Cafe Un Deux Trois. Lunch the next day was in the theater district, just a block away from the Shubert Theater on W 44th, where we saw “Matilda,” a fun musical. 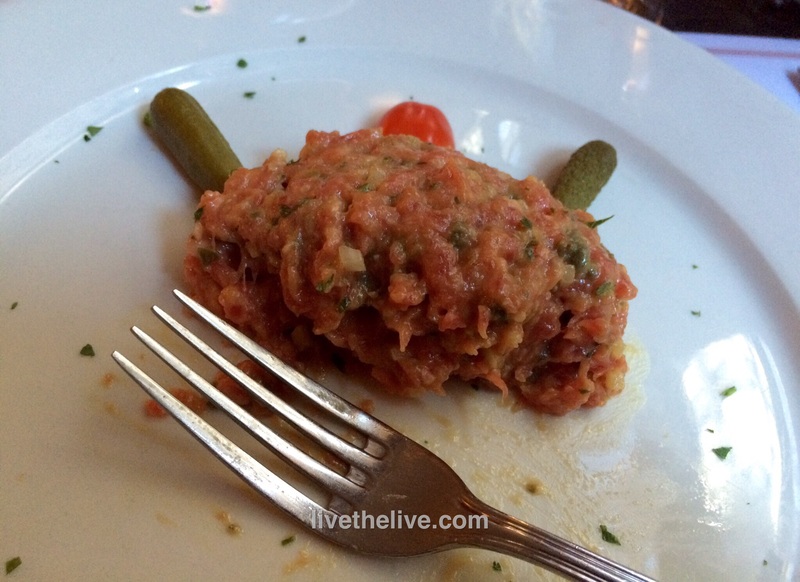 We ate at Cafe Un Deux Trois, a French bistro style restaurant that has withstood the test of time, and for good reason: a fun atmosphere, good food, friendly efficient service. We had lunch with my college buddy, Don, and we all enjoyed our meals, from salmon to Caesar salad to pasta to beef tartare. The theater district in NYC is known for some bad restaurants. They thrive because they’ve got a captive audience. Cafe Un Deux Trois is a good one to keep on your list. R Lounge at the Renaissance Hotel, Times Square. 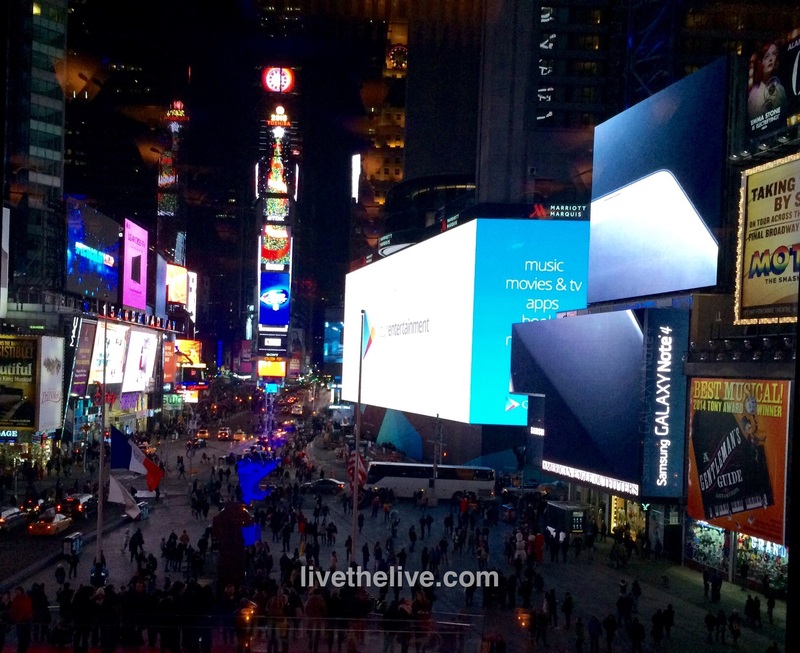 After the theater, we walked just a few blocks to the Rennaisance Hotel in Times Square. The lobby is on the second floor, and that’s also where you’ll find the R Lounge. By far, the best view you’ll get of Times Square. Grab a cocktail, bring a friend, and enjoy the lights of Times Square as the sun sets. There is no cooler place to take a date or someone you want to impress with your knowledge of hidden gems in the city. 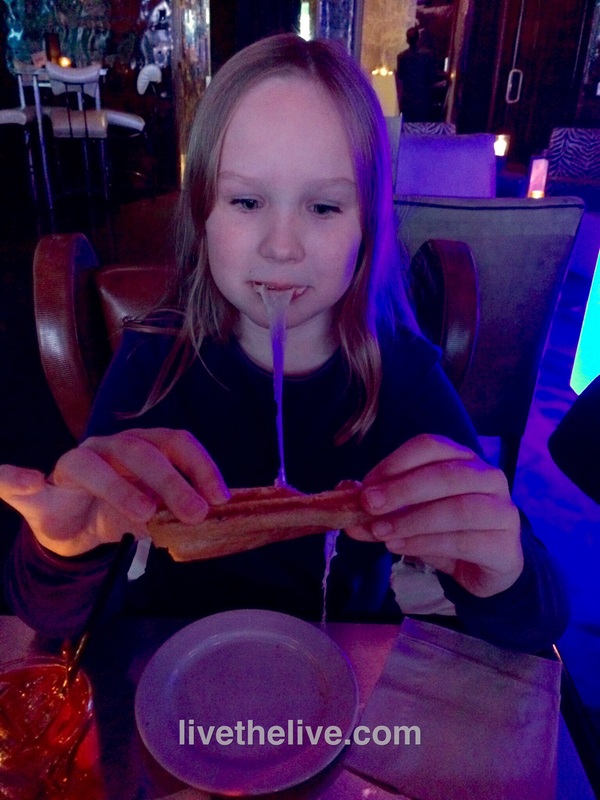 My daughter loves the grilled cheese. I go for the martinis! 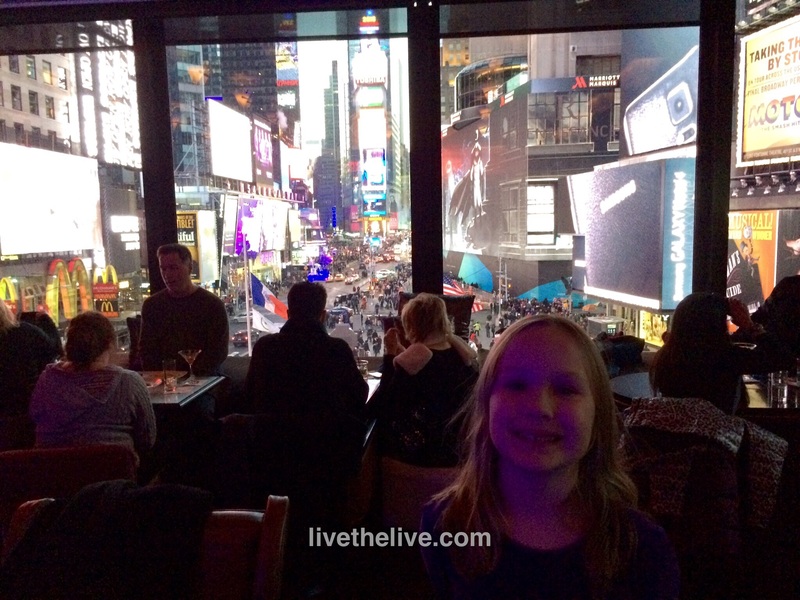 Best view of Times Square from the R Lounge. After the R Lounge, we headed back to our hotel room to meet my wife for dinner. Unlike earlier years where we stayed at my wife’s conference hotel, the Hilton, this time we stayed just a block away at The London. What a difference: a larger, more modern suite with loads of space for the three of us. A huge, beautiful bathroom, and not just by NYC standards. The hotel restaurant is Maze, by Gordon Ramsay. Didn’t eat there. Not a fan. 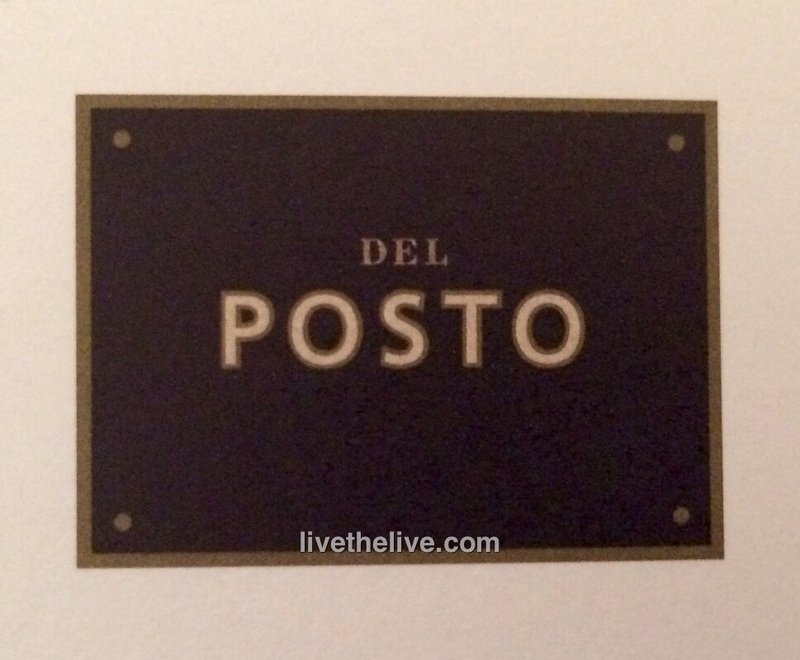 We grabbed a cab and headed downtown to 10th Ave between 15th and 16th Streets for Mario Batali’s restaurant: Del Posto. The fact that it’s a Relais and Chateaux property already sets it apart from most other dining experiences in the city. Many restaurants don’t change with the times, and very often you get the same uninspired dining experience. This was our fourth trip to Del Posto, and it topped our previous three visits in so many unexpected ways. Since our last visit a few years ago, my wife has had to go on a gluten-free diet. To our surprise, every single pasta dish offered on the Del Posto menu, and there are at least a dozen of them, are offered gluten-free as well. House made, gluten-free pasta, so good you would never know it was GF unless they told you. Our server, Robert, one of the most knowledgeable servers I’ve encountered in my travels, helped us with our selections, and his wit, charm, and easy-going personality raised our dining experience to a whole new level. Simply, there was no question he couldn’t answer. Robert explained to us that almost 40% of customers now ask for gluten-free offerings so the amuse bouche they bring to the table for everyone to start the meal is totally gluten-free. Again, you’d never know unless they told you, and again, blazing a path other restaurants have only begun to follow. My wife and I chose the five course meal and everything was spectacular. A crudo plate of five different fishes, a veal and tuna pate, two different pasta dishes–one with lambs neck sausage, the other with pumpkin and browned butter–and our entrées of a perfectly brined and roasted veal chop and a magnificent pork trio that featured porcini mushrooms and pancetta. And it should come as no surprise that my 8-year-old daughter was treated with respect and got exactly the pasta dish she asked for. A live pianist played many of the classics (Billy Joel’s “New York State of Mind,” of course) but also Pink Floyd, Jimi Hendrix and the Beatles. I’m not a fan of restaurants going from the beautiful and easy-to-manage wine list in book form to the iPad. Del Posto has joined the iPad ranks, and I think it’s not a good move. There is a charm to the old wine list that is lost with the new technology. And it doesn’t help that the iPad dies in mid-selection. Great service, great food, and great atmosphere in New York City comes, of course, at a price. But you are, after all, playing with the big boys here. This is a true New York City fine dining experience, one that you will remember for a long time. 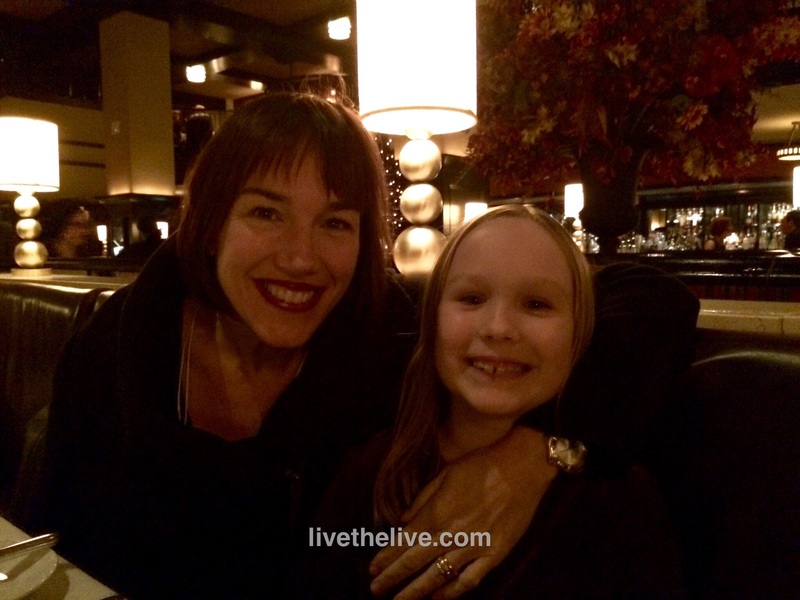 Our fourth trip to Del Posto was so great, I’m already looking forward to our fifth. 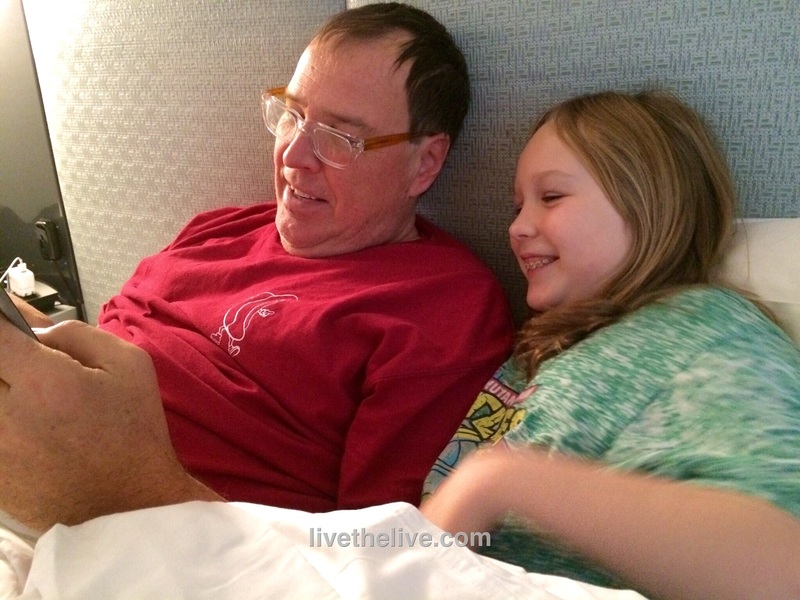 As my wife was off at a conference, Sunday morning for my daughter and myself started lazily, with an in-room breakfast (gotta do it at least once every trip) with room service from The London. I had my standard lox and bagels with all the fixins, and my daughter loved her plate of pastries. My wife and I are iced coffee nuts, so we order a large pot of hot coffee the night before, and let it cool in the fridge overnight. The London is one of the very few Manhattan hotels where there’s actually an ice machine (with filtered water to make your ice very nice) on every floor! Rather than ordering ice via room service, which is a royal pain, a full bucket is just a short trip down the hall. 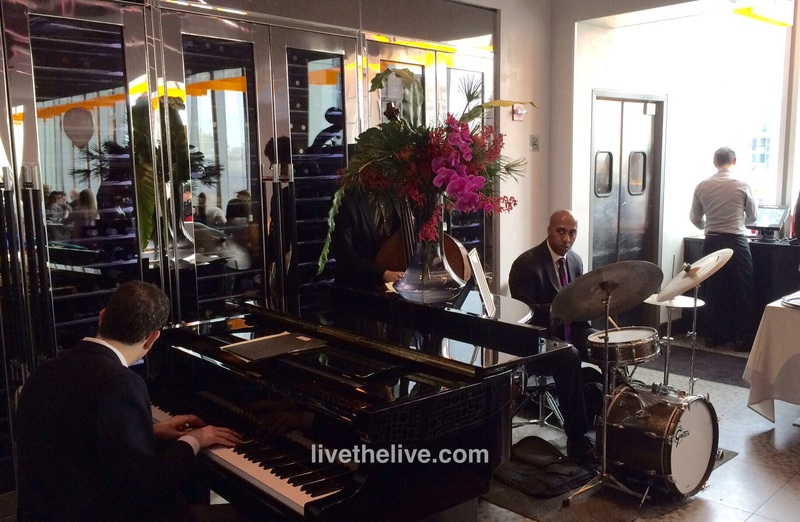 Live jazz for Sunday brunch at Robert. 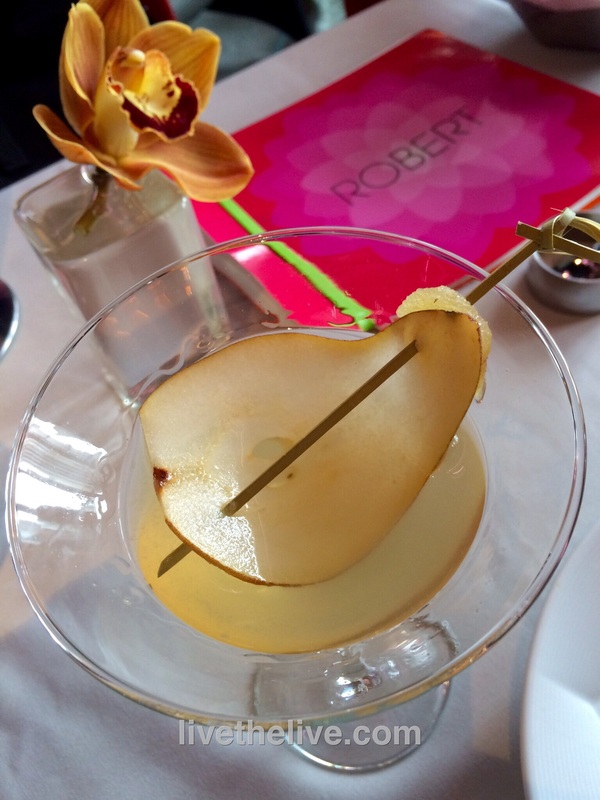 For lunch, we headed to Columbus Circle and one of our favorite combinations of art and food: the restaurant called Robert on the 9th floor at the Museum of Arts and Design. The museum’s OK…it’s a hit or miss kind of thing. But Robert hits the mark every time. 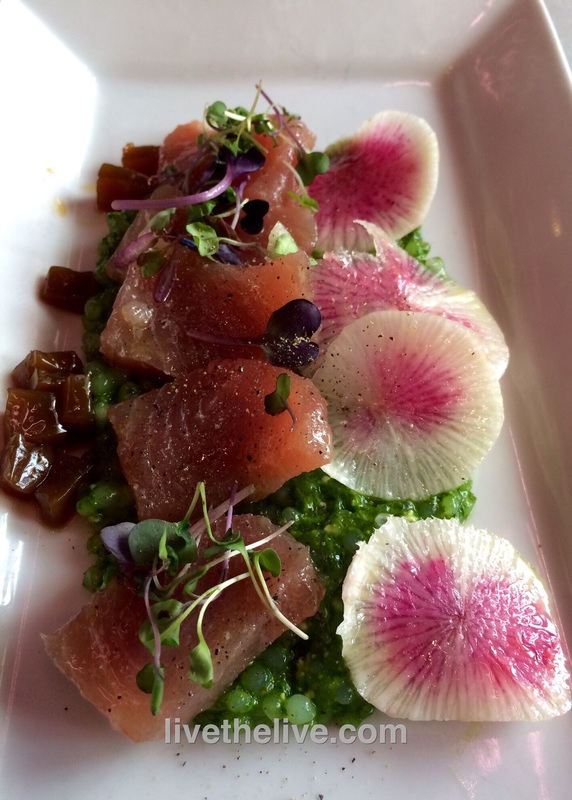 We visited during Sunday jazz brunch, but there were plenty of menu choices other than the basic breakfast items, including a crisp Caesar salad, rich butternut squash risotto, and a refreshing tuna crudo. Robert has that great combination of a cool room, great views, and great food and drink. A fun place to take someone you want to impress with your knowledge of New York City. 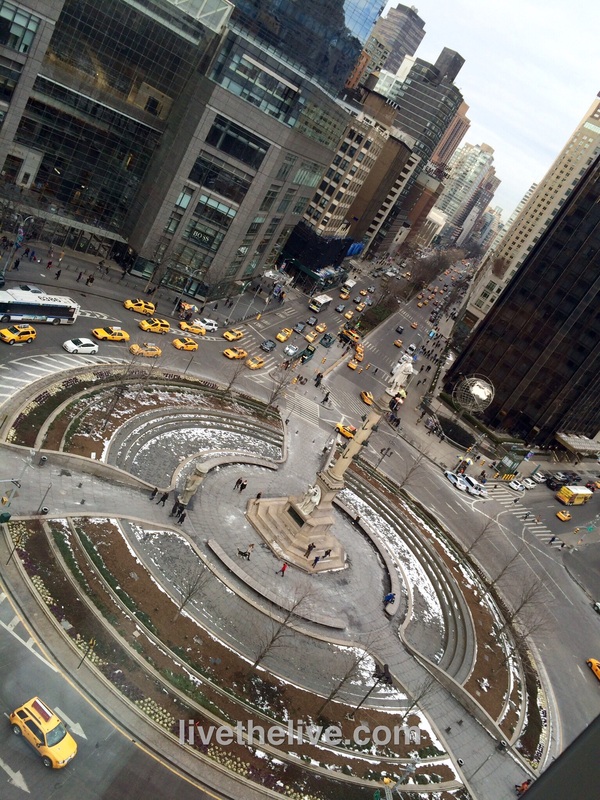 A view of Columbus Circle from Robert. Satisfied with a great lunch, we needed to walk it off a bit, and the nine blocks to the new Maille mustard boutique in the frigid cold was just enough! Maille mustard is world-famous, and we make a pilgrimage to the store in Paris when we travel there. The mustard comes fresh out of a tap, and we bring our empty crocks back to have them refilled. 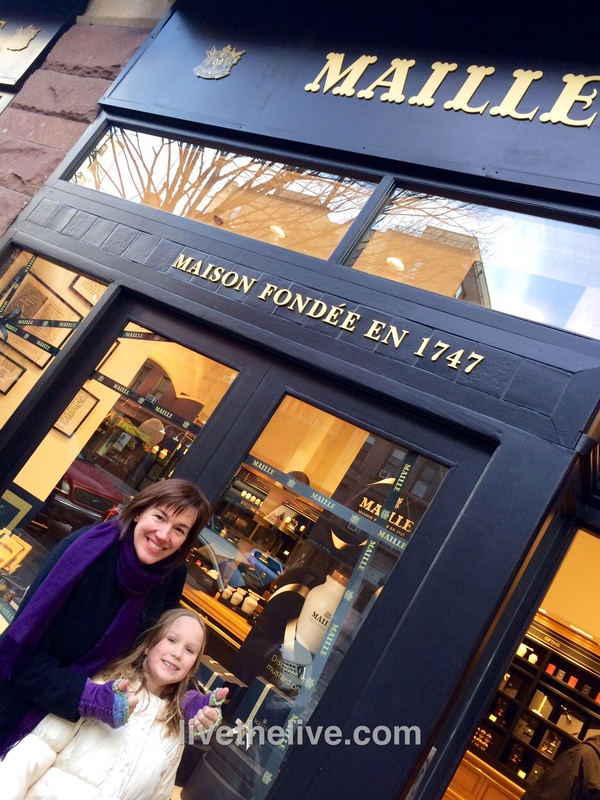 So to have a Maille boutique close to home in New York City is just awesome! Maille mustard boutique, Columbus Ave. and 68th St. Bags full of mustard for ourselves and some friends, we unloaded our treasure back at the hotel, and then my daughter and I made our way to Rockefeller Center, home of the Lego store, located right next to the skating rink. The Christmas decorations were gone already, but there were plenty of people skating, and the Lego store was packed. 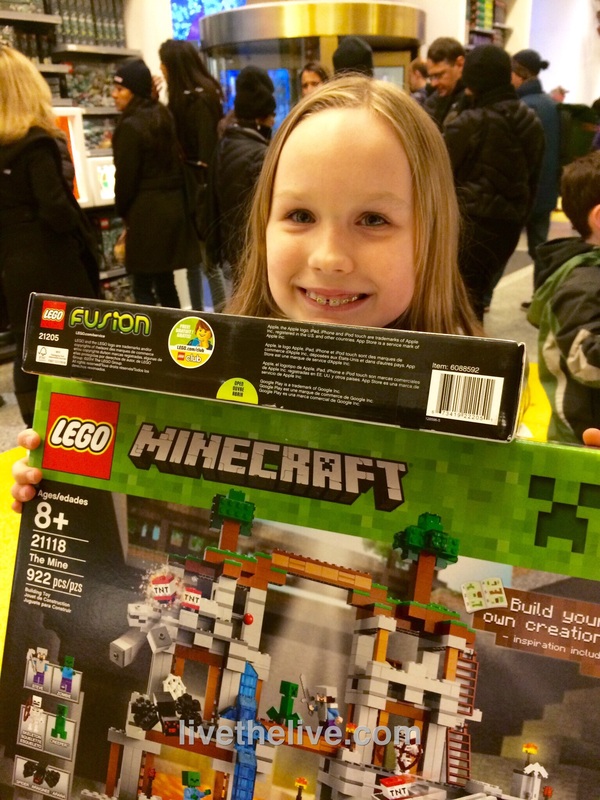 A true Lego fan, my daughter used all the gift cards she got for Christmas to buy a few Lego sets for her next projects. It was a bitterly cold day, but we walked to our dinner destination: The Lambs Club at the Chatwal Hotel, a restaurant by Iron Chef Geoffrey Zakarian. What a disappointment. I wasn’t expecting to be amazed. I’ve seen other reviews. But the food at the Lambs Club was just plain bad. The foie gras dish I ordered looked and tasted like it had been made days earlier. Part of the reason I order foie gras is for that wonderful subtle mouth feel and flavor, almost non-existent with this plate. Way too many strong flavors that masked the foie. I ordered the Amish chicken, hoping for a nice roasted bird, maybe some crispy skin. Instead, it was be de-boned, rolled into a sausage shape and from what I could tell, sous-vide, then placed on a salty brown sauce. My server suggested the shaved brussels sprouts for the side. They arrived uncooked, with a salty malty topping. Maybe it was my fault for assuming the chicken would be roasted, the sprouts would be cooked. But neither the menu nor my server made me think otherwise. My daughter liked her pasta with tomato, guanciale and cheese, but even she said: “Dad, where’s the guanciale?” I couldn’t find more than 1 or 2 bits. The dining room was only 1/4 full. Should’ve been my first clue. What made this place worth visiting was the small bar at the lobby…just 4 seats, but the guy behind the bar, Kevin, a friendly and knowledgeable young man, knew his mixology. I had several wonderful cocktails that almost made me forget my bad meal. Almost. 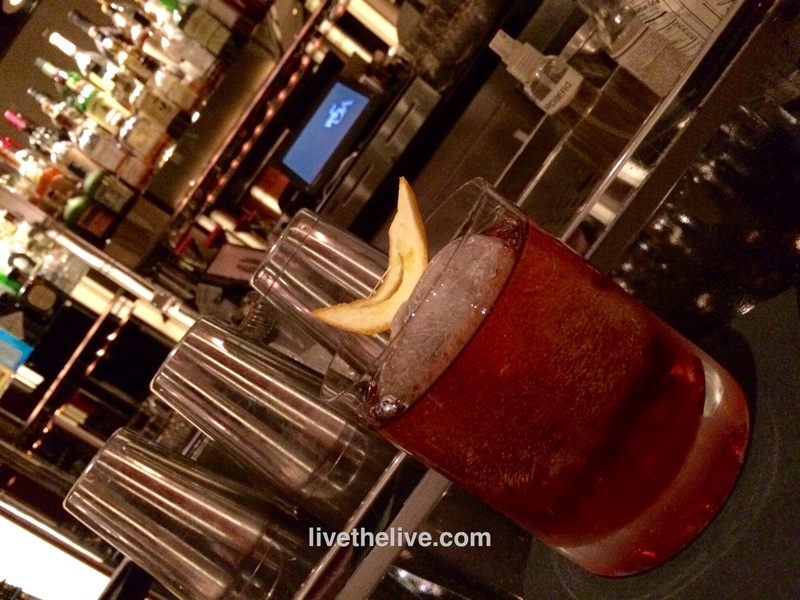 Excellent cocktails at the Lambs Club…but that’s about it. A fun last weekend of debauchery in New York City–some ups, some downs–before I started a month-long no-carb, low carb, no-alcohol diet!